Running The Chicago Weaving School means I get to hang out with many amazing people every single day. What makes these people, absolute beginners to very advanced weavers, amazing? On some level they’re all interested in more than just the physical result of their pursuit. They can get just as excited about the process of learning to weave as they can about the final woven product. The obvious achievement that comes with learning to weave is the cloth you make. It’s the tangible product of your work. But if that were the only objective, would it be worth all this trouble? Once you’ve been weaving a while, you can really start to appreciate all that goes in to this craft/art. Weaving teaches us patience, mindfulness, perseverance, the ability to make decisions, self-awareness, visualization, and creative problem-solving. By engaging in this craft, we develop a greater ability to notice the things that inspire us. We learn how to build on that inspiration to make something that is an authentic expression of our own unique gifts. We find delight in new discoveries and connection to others. We experience intellectual stimulation, sensory stimulation, and heck, I’’m not afraid to say it…vastly improved math skills! But it’s not always easy to notice these intangible benefits and personal victories. We get preoccupied with the inches, edges, and mistakes. We pay more attention to what’s NOT going right. And sometimes we are just plain hard on ourselves. So, to all you beautiful, imperfect, striving human beings out there. I challenge you to start noticing your small triumphs and victories. Start developing a regular habit of tracking the strides you make in the not-so-obvious aspects of your weaving practice. Last year would you have even noticed the mistake to unweave it? Would you have noticed it but not been able to figure out what you did wrong? Maybe you would have known, but just not had the stamina or perseverance to slow down, turn back, and make it right. These are internal, non-tangible victories and they are AMAZING. If you are already keeping notes about your weaving projects, (sett, length, width, weave structure, etc.) why not add to these by writing down your not-so-tangible intentions or achievements? 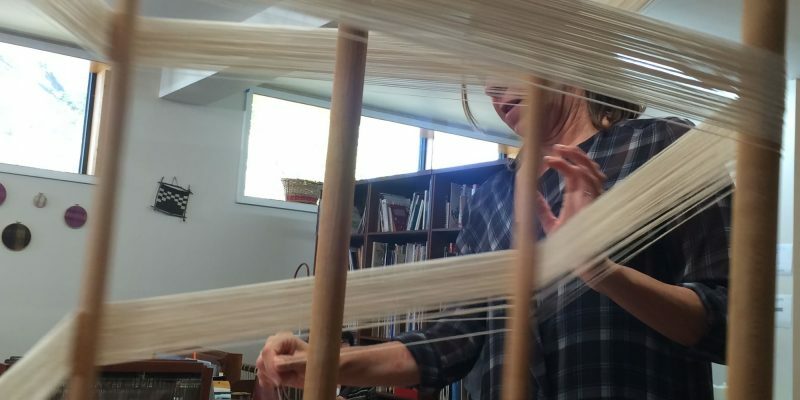 You might want to take a moment at the start of a new piece to reflect on where you are now, and where you want to eventually be, as a weaver. Write down your intention, and place it where you will see it when you weave. Different people might have vastly different intentions. When I sit down to weave, I’m going to put my phone away and not check email alerts. I intend to allow myself the experience of being totally in flow and undistracted, even if it’s only for 30 minutes. This project will be a great opportunity to work on an even beat. I’m going to experiment with different ways to do that. My objective for this piece is to try some color combinations that are a little bit outside my comfort zone. I’m going to let myself play and experiment with this piece. Just for today I’m going to practice not taking it all so seriously. I’m going to work on how I handle frustration and disappointment. Today, if I discover a threading error, I will allow myself exactly ten seconds of whining and then I will shut up, untie, and rethread. Today I’m going to appreciate my efforts, without comparing myself to other weavers in class. If someone compliments my work, I’m going to say “thank you” rather than make a face and point out all the mistakes I made. Conversely, you may want to make note of any progress, realizations, improvements, or just plain “good things” at the end of a weaving session or completion of a project. As a teacher, I like to do this at the end of every class. I’ll jot down notes in my calendar book: when something seemed to “click” for a student, when I notice a student able to problem-solve a loom issue before asking for help, or when a student asks for help who in the past would tend to suffer in silence. By engaging in this craft, you are doing so much more than just making woven products. You are evolving. You are growing. Make note, and pat yourself on the back.